The Cover Me by Tui goes on and off your pet quickly and easily, and even has a built-in potty cover so there's no need to remove it when your pet needs to relieve itself! It will keep your dog comfortable and clean. Why Make Your Dog Suffer More Than Necessary? It’s a simple fact that most pets hate wearing e-collars, and it comes as no surprise. With these lampshades around their necks they’re constantly running into walls, furniture and even their owners. It can also be difficult and dangerous for pets to get up and down stairs while wearing them. Some pets even get so depressed they stop eating! Finally there’s a real solution that will keep your pet from licking and chewing at surgical sutures and hot spots without all the negative side-effects of wearing an e-collar! The new Cover Me by Tui is a patent pending, breathable, washable pet garment available in seven sizes with adjustable straps for an even better fit; so it will comfortably fit every pet from Chihuahua to Great Dane. See the easy-to-use sizing chart to determine what size your pet needs. You can also check out the photo gallery for snapshots of pets of all sizes wearing their favorite new Cover Me by Tui! 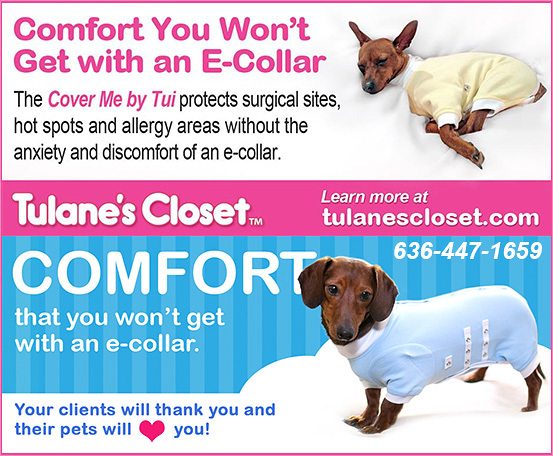 The Comfortable, Convenient Solution to the E-Collar! The "Cover Me" by Tui goes on and off your pet quickly and easily, and even has a built-in potty cover so there’s no need to remove it when your pet needs to relieve itself! The Cover Me by Tui is available in two styles: Step-Into and Pullover. See our step-by-step, illustrated How it Works instructions to decide which style is right for you and your pet! When Can I Use The “Cover Me” by Tui? • Any time the pet is in distress. NOTE: The Cover Me by Tui definitely helps with calmness which helps for a better night sleep for you and your pet. Will My Dog Be Able To Go Potty When Wearing The “Cover Me” By Tui? Yes!! We know that nature calls and that is why we have taken the extra care to create a “snap on” or “snap off” potty break flap! Takes seconds to unsnap, roll it and snap it up and away on the chest area—your dog will be able to use their “Cover Me” without fear of soiling! What Styles Do I Have To Choose From? While we have many colors we have 2 basic and very comfortable styles. Our PULLOVER style allows you to just ease your “Cover Me” over your pet’s head. The STEP-INTO style which allows the pet to just step-into the “Cover Me” and snapping down the back. You decide which might be more comfortable for your dog. Can My Dog Wear Their “Cover Me” by Tui Just Because It Keeps Them Warm and Comfortable? Yes, the Cover Me by Tui may also be used as a Cover Up to keep your pet warm but will not over heat your pet as it is made of 100% Peruvian cotton which is light weight and breathable but still has 4 x the strength and length of an ordinary cotton fiber. Also, Reusable and can be machine washed and dried. Is It True That Even My BIG Dogs Can Wear A Cover Me ? The Cover Me by Tui fits every size pup from Chihuahua to Great Dane! The largest breeds of all have the most difficult time with the old fashion e-collar so we made certain to Cover the big guys too!! But I Need My Cover Me By Tui Almost Immeidately! NO Problem! We typically ship same day and you can get your Cover Me by Tui in as little as overnight if you like or priority mail 2-3 days. We know you need it now and we can make easy arrangements for that! Order Now and Get a FREE GIFT ! It’s time to throw out the old-fashioned e-collar and treat your pet to the new Cover Me by Tui. It delivers all the protective benefits of the e-collar without the negative side effects, and is available risk-free with our money-back guarantee! Call NOW to Order and get a FREE Key Chain Light! You'll love seeing your dog so comfortable and cozy!